Oase, The spark that lit the Romanian Kendama scene. 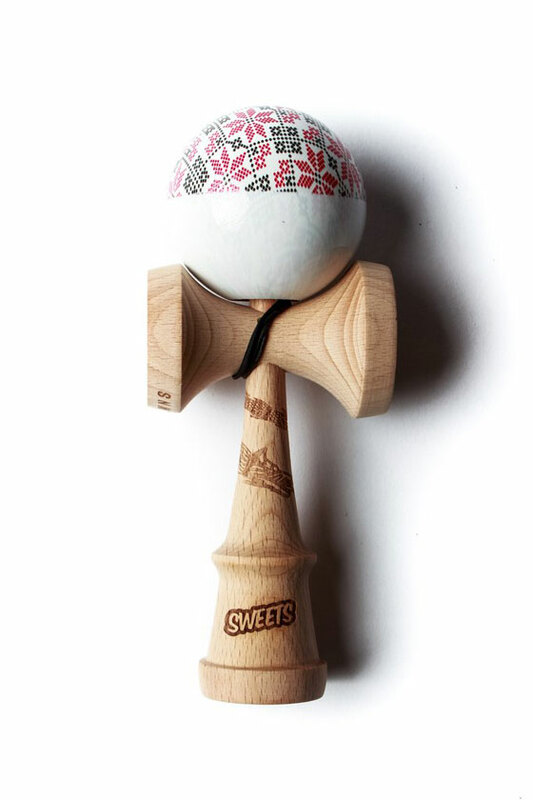 The Legend Model is a special kendama made for past Sweets Pro Team members. These players are truly legends in the kendama world. Oase is not only an amazing player, but a huge advocate for Spreading Kendama Love. He was one of the first players ever to be sponsored by Sweets Kendamas and is the founder of the Sweets Kendamas Romania team. His work in Romania is example of how influential and important Oase is to Sweets and kendama as a whole. We are honored to announce the 2017 Oase Legend Mod. This kendama has been fully tricked out to show Oase's personality and love for his home of Romania. The pattern on the tama is based on traditional Romanian quilts, the halfsplit offers excellent tracking while the Prime Sticky Clear makes it great for landing any balance trick. Oase means 'Bones' in Romanian, so the the beech Prime Ken features a portrait of Oase as a skull and cross bones in the big cup. His crew SVGCLWNS gets a shoutout on the bottom of the small cup. Most noticeable is the Wolf wrapped around the spike, this is a traditional Romanian symbol that Oase identifies with, and has tattooed on his body. We worked closely with Oase to make a kendama that is exactly what he wanted. Each Oase Legend Mod includes an extra string, instruction booklet, and custom stickers.